Using a vision board is a great way to stay focused and accomplish your goals. My vision board contains goals and milestones I want to accomplish in my life. But you can have a vision board about anything. You can create a vision board to help you reach the goal of organizing your home. You can create a vision board to help you plow through that project that you have been putting off. Whatever it is I encourage you to create a vision board in order to reach that goal you have set. I just completed my vision board for 2015 that is in my iBloom Life & Business Planner You can see the unboxing here(http://youtu.be/krWllY5K0GM). I am really excited about this year’s board because I will have my vision board with me at all times as I tote my planner around. I have no choice but to look at it every day and be reminded of what I am trying to accomplish this year. Usually my vision board would have long term goals on it, and I still have my original board that has those long term goals. 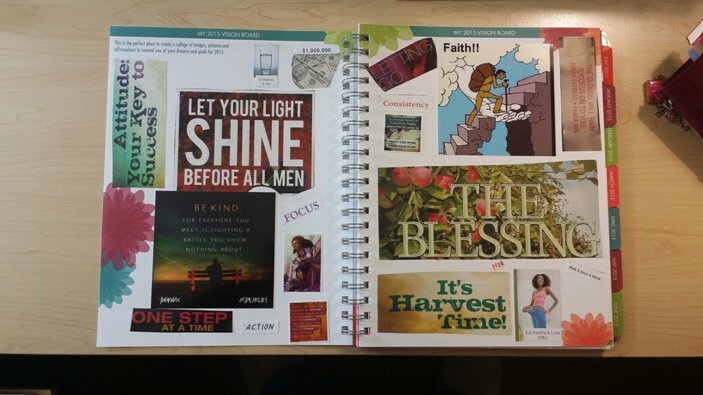 But this vision board in my planner is specifically things to motivate me this year to accomplish the goals that I have set forth for this year. I have also included a lot of affirmations and quotes that I am aspiring to or want to keep in my remembrance. As you can see there is no set way to do a vision board. You can do what speaks to you and what will keep you engaged to actually look at it daily. I have included a picture of my 2015 vision board and I hope that it inspires you to create one of your own. Whether it be long or short term goals use this powerful visual aid to accomplish all that you want in life. Here we are at the end of the year and I can’t help but look at all of the things that have happened this year and where I was a year ago. I have made strides from last year. And I look forward to even greater in the new year. I have learned from the setbacks of this year and have grown from the disappointments. I have found hope in the triumphs and even stretched myself out of my comfort zone this year. It hasn’t been easy but nothing worth having in life is. I’m encouraged to keep pressing forward and celebrating the little victories. No matter how small any step is worth celebrating. I encourage you to take time to reflect and process what has happened this year, but to also look ahead with great anticipation for what the new year holds. Don’t let any disappointments get you down. Take the lesson from any setbacks and keep pushing forward. I will see you in 2014! Let’s reach our goals together. This is a departure from my usual post but I wanted to share some things that I have been going through lately. For the past few months I have been really thinking and trying to work on me and some of my old mindsets. I was getting to a point in my life where I knew I wasn’t where I wanted to be and I had moved away from things that I use to enjoy. I was starting to be frustrated and stressed. This started to affect my relationships with families and friends. So I set out to make changes. I knew that a year from now I didn’t want to be in the same place. I started making intentional efforts to accomplish goals that I had and results I wanted to see, not only in my business, but my personal life also. I finally had to realize that no one was holding me back but myself. I had to do the work and push through. I had step outside of my comfort zone. I often find that my clients struggle with the same types of things where they are trying to do everything at once and feel like they are on a never ending treadmill. My best advice is to slow down and really take time to reflect and be honest with yourself about what is working and what isn’t. Be grateful for the things that do work and then actually do the work to make changes in the areas that aren’t working. That is what I am doing now and I feel so much better. I have gotten back to journaling and forgiving myself if things don’t go according to plan. 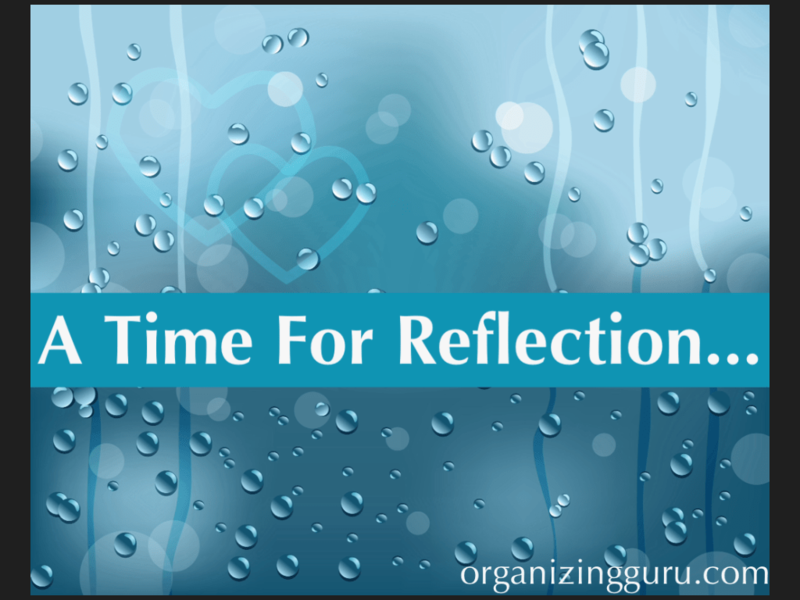 Are you in a time of reflection? If so I would love to know what “Aha” moments you have had. Share in the comments below and let’s support each other on this journey. Work At Home Moms (and Dads)! Are you a work at home mom or dad like me? Would you like to be? If you want to know how to start a business from you home that is legitimate and actually works check out the video clip below.